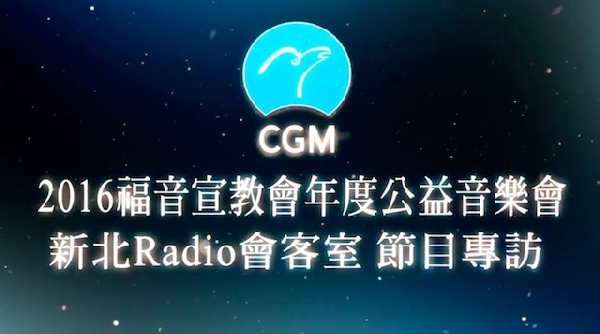 The famous Hakka Radio Show host Hui-yueh Liu, from the New Taipei Hakka-Radio, invited the Christian Gospel Mission (CGM) for an interview to talk about its 2016 yearly charity concert. Rung-jou Liou, the conductor of the event, hoped that through music, the people of Taiwan can find their inner strength and feel some love, peace and hope as they struggle in this problematic society. The performance list for this event was diverse in its musical repertoire, including Taiwanese songs, Aboriginal folk songs and Hakka folk songs. Da-Pu Tune, a Hakka song unlike those that are usually selected for concerts, resonated especially well with Host Hui-yueh Liu. While watching the choir practice, host Hui-yueh Liu was intrigued by how different sounds are produced through various vocal techniques. When she asked the composer Chun-hui Lin to describe her inspiration for the harmony arrangement, Lin explained that she wanted to relay the romantic flavor of the entire song through various vocal harmonies. Two thirds of the band members are music lovers; however, they are not professional musicians. Chun-hui Liu explained that while they may lack in technique, they work hard with the positive attitude and the perseverance they learned from hearing God’s Word at church, thus she continued to encourage them to achieve their goals. The founder and president of CGM - Pastor Jung Myung Seok - places great importance on nurturing young people because they are the ones with dreams and passion. He encourages young people to take courage in experimenting new things through a variety of different platforms, where they can discover their interests and unique qualities. It is worth mentioning that this is the first time Hakka folk songs are sung at the charity concert. The team members worked extremely hard in their preparations for this new venture and breakthrough. Everyone is welcome to enjoy the event held on Dec 10 at the Chung Hsing Hall in Taichung City.